This entry was posted on August 6, 2015 by Tinteán Editorial Team/EMcK, in Forthcoming conference, History, News, Of Literary Interest, Popular Culture, What's On... and tagged Fitzgerald of Desmond, history, Irish Ancestry, Irish culture, Youghal. Bookmark the permalink. Youghal was an important administrative and commercial centre in the late Medieval period and up to the 19th century. In earlier times the area was associated with significant monastic settlements such as Molana Abbey which had an international reputation for scholarship. Each year a History Conference is held over two days with highest quality speakers, field trips and activities relating to our heritage. 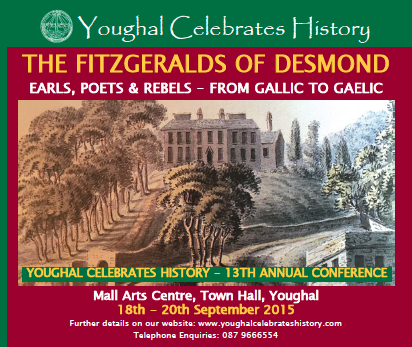 For further information about the conference/accommodation/the organisers of the conference see: Youghal Celebrates History.